This weekend many of my genealogy friends are attending the RootsTech 2015 conference in Salt Lake City. Unfortunately, I’m not there. I figured that February travel ought to include someplace warm… Little did I realize that the high tomorrow for Salt Lake City would be 54 degrees while we’re expecting a wind chill of 0 here on the East Coast. But hearing about all of the new technology and how it can relate to or help our genealogy research is in stark contrast, much like the weather this weekend between those two locations, to what genealogical research used to be. In the last few weeks I’ve been organizing and de-cluttering my home office, and I found my notes from a non-credit genealogy course I once taught. 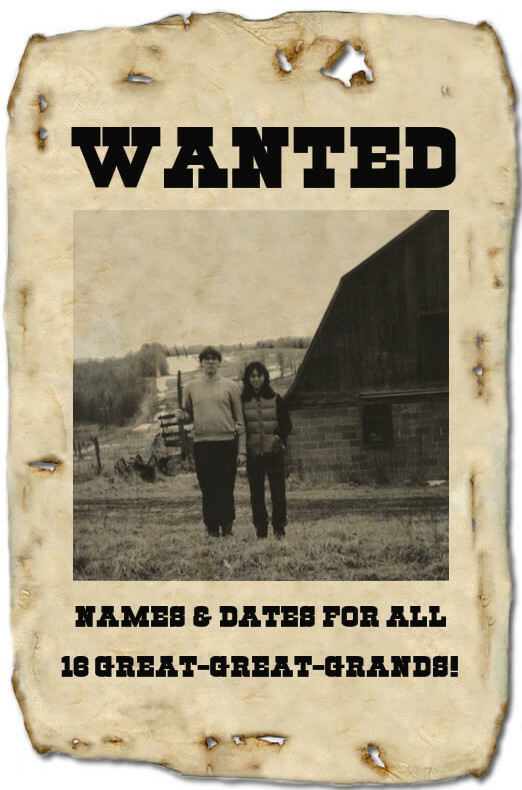 From about 2000-2002, my friend Marie and I taught the basics of researching your family history in a 5-week class at a Philadelphia university. It wasn’t until I looked over those notes that I realized just how much genealogical research has changed in the last fifteen years – mostly due to computers, the internet, and digitization projects. Not to mention DNA testing! The first week of the class we focused on Federal Census records (at the time, the latest year that was released was 1920 and none were online), and the first thing we “taught” was all about Soundex. Today, while newcomers to genealogy might hear about Soundex and understand it conceptually, there is no need to really use it anymore. When I first started my research back in 1989, figuring out the Soundex code for my surnames almost added to the thrill of the search because it appealed to the cryptogram and code-loving days of my childhood. Today, it really doesn’t matter that my name converted to P532 because we no longer have a 2-step manual search through various microfilms (yes, microfilm constituted high technology back then)-just a short wait after the click of a button to see the possibilities. But besides the onslaught of the availability of online digitized records (which we sparingly covered in the last week of our class in 2000), I realized that much of what we taught still applies as much today as it did a decade ago – or two hundred years ago. 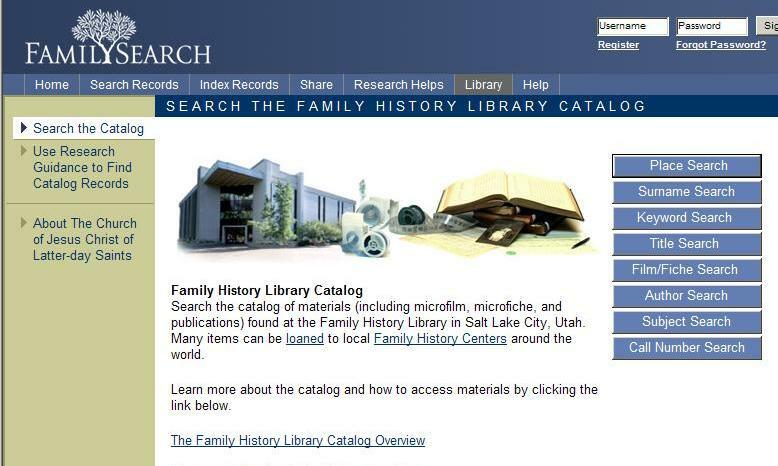 Step #1 in researching your family history – then, now, and forever more – is gathering all of the information you already know from talking to relatives. As evidenced by the photograph above, I used whatever means available at the time to capture that information. Yes, friends, that is a paper plate. And an envelope. You see, back in those beginning days of research, I’d constantly pepper my parents with questions. Once I’d find something, perhaps a fact or person they hadn’t mentioned, and I asked again, it would jog their memory to reveal more information that I’d hurriedly write down. My parents’ house is renowned for never having notepaper, or a pen, available when one needs it, so I’d reach for whatever would serve as paper. Not as cool as Evernote, Family Tree Maker, or even Notepad – but it got the job done. Looking back on these relics of research (before I finally toss them in the recycle bin), one thing is certain – those little tidbits of information I wrote down were, eventually, all either proved or disproved by my research. They were clues, and the search – whether you are using a computer and the latest technological advances or not – begins with basic family information. Write down everything you know. Talk to living relatives about everything they know. Remember that spellings can change and were flexible in the past. Remember that history is important to know and geographical boundaries change over time. 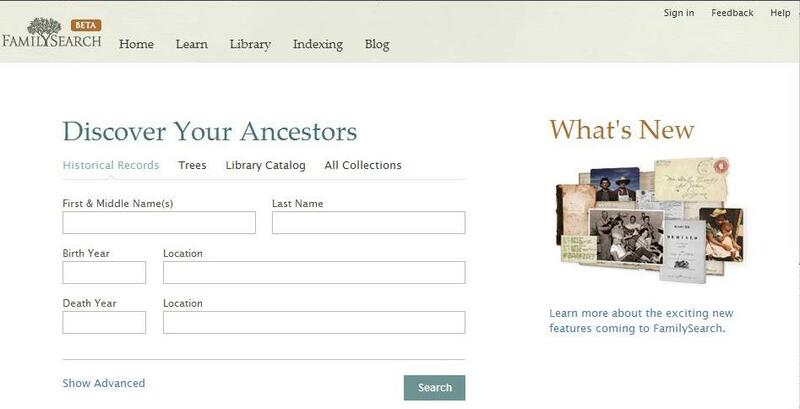 One other tip that people just getting started in genealogy in today’s age of technology just don’t quite fathom…not every record you need to trace your family can be found online. That doesn’t mean it can’t be found, it’s not not as easy as clicking a button. Happy Ancestor Hunting! Ryan, Beckett, and Castle in front of the murder board (Seamus Dever, Stana Katic, and Nathan Fillion in Castle's Season 3 episode "Close Encounters of the Murderous Kind"). Accessed via Castle-Fans.Org on January 9, 2012. 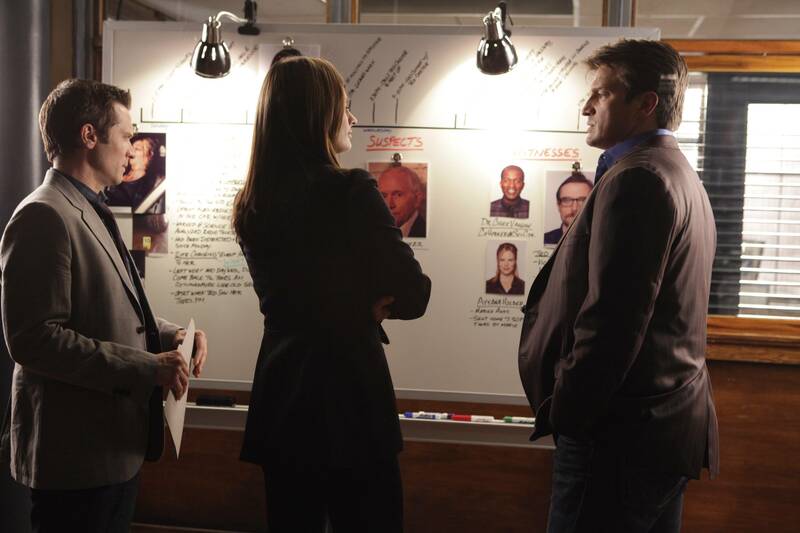 On Castle, the NYPD homicide unit, led by Detective Kate Beckett (Stana Katic), sets up a “murder board” for each new case. They take a white board and start with a photo of the victim and some pertinent facts. Next they add information on potential suspects, witnesses, and a timeline of events leading up to the murder. The character of Richard Castle (Nathan Fillion) is a best-selling mystery author who “assists” the detectives on their cases. Castle usually adds the “outside the box” thinking on how all of the pieces of the mystery fit together with how he, as a writer, would have written the story. The “murder board” concept is perfect for solving genealogical mysteries. In fact, I realized I’ve had a murder board for years without calling it that. The victim is the research problem – in my case, the birthplace of my great-grandmother Elizabeth (Elżbieta) Miller Pater. The suspects are the potential places based on clues I’ve found in my research of documents such as passenger list records and other documents that contain information about an immigrant’s birthplace. On the show Castle, sometimes the detectives really think a particular suspect is the killer – the suspect was in the right place at the right time, had means and motive to commit the crime, and all of the facts seems to support the person as the one who did it. But sometimes there’s a problem…the suspect “alibis out”. That’s the term the show uses when a suspect has an alibi that checks out upon further review, so he or she could not have committed the crime because there is some evidence that places the person in another place at the same time. In genealogical research, we often think we have the right answer based on sources that seem to indicate it’s correct. But then the answer alibis out. All records – including some in my great-grandmother’s handwriting – point to the town of Żyrardów as her birthplace. But Żyrardów is the wrong suspect – the town alibis out! When the records were checked, the record for her birth was not found. What’s next? In solving the murder mystery on Castle, the team turns to other sources such as witnesses or financial records that might lead to more clues or more suspects. Sometimes they take a closer look at the timeline to see if they missed something in their initial research. All of these actions have a lot to teach genealogists looking to solve their mysteries when the Number One Suspect alibis out. In short, look for more clues! Are there any witnesses? Maybe older family members recall information that was passed down about the mystery. Who else was connected to the mystery/victim? Turn to records for siblings, collateral relatives, or even neighbors of the person you are trying to find. When did things happen? Sometimes just creating a timeline for an individual can help cross some suspected places, times, or events off of the list of suspects. No matter what avenue your research takes, using the murder board concept can be very helpful – write it all down and plot it all out. Even the negative searches – the suspects with alibis – need to be listed so you remember what resources you’ve already checked. Often in the show, the characters literally stare at the board trying to see if they missed something that will lead to a new search for a new suspect – or a new search for a former suspect who’s alibi was questionable or unproven. Often Castle will find a new direction based on his unique writer’s view of the “story”. Likewise, it benefits genealogists to re-view information, and to re-search, in order to find that missing piece to the puzzle. It also helps to get help from someone like Castle – someone not so closely related to the case who might have a different view of those same facts. I don’t have an actual physical board of information for the case of my great-grandmother’s birthplace, but after watching a few seasons of Castle I’m beginning to think it might be a good idea to throw all the pertinent facts up on the wall, or at least down on paper. This will enable me to review the facts and review the suspects and perhaps finally solve this mystery. Where is Mr. Castle when I need him? I could use his help! Did you ever have a moment in your research when you realize you made a mistake? A rather dumb mistake? Well, bloggers aren’t afraid to publically humiliate themselves by drawing attention to their mistakes, because our dumb mistakes can serve as a lesson to others. What’s past is prologue, right? I recently wrote about the sister who disappeared. She ran off and got married to someone, name unknown, and never contacted her family again. Or at least that’s the way the story went. The truth is – she never contacted her brother James again, my grandfather. But she apparently kept in touch with her brother Joseph! Since Joseph, my father’s uncle, died on my father’s birthday, it was one of the few family death dates that my father knew without a doubt. I used that date to obtain a copy of Joseph’s death certificate, which provided me with his birth date (that was later verified through other records). So why didn’t I ever search for an obituary or a death notice? Probably because I’ve rarely found one for any of my relatives. Or, I didn’t think it would tell me anything I didn’t already know. That would be the genea-understatement of the decade. If I had searched for one twenty years ago at the start of my research, I would have learned the missing sister’s name and place of residence in 1953. I also would have learned the married names of my father’s two female cousins – something my father either did not know or did not remember. So now I know. Finally. Let this be a lesson to you, kids – search for every piece of information you can. As for the sister who disappeared? Jean Hynes. More to come on Aunt Jean in the future. I’ve learned a bit about her life since finding out this vital piece of information, but I still have not discovered anything about her death. Once I do find her death date, I’ll certainly be sure to look for a death notice or obituary! 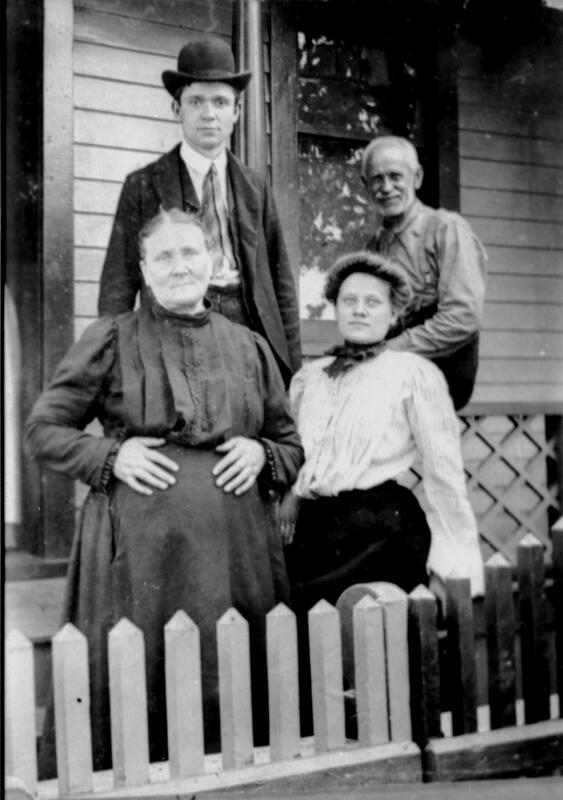 For our weekly Saturday Night Genealogy Fun, Randy Seaver challenged everyone to list their sixteen great-great grandparents, along with their pertinent birth and death dates and locations, in Saturday Night Genealogy Fun – Your 16 Great-Great-Grands. Many geneabloggers responded to the challenge. Midge Frazel further encouraged participation by gently nudging us on in This is a test of your local broadcast system. Even though a lot of folks took up the challenge, many discovered that they DO NOT know all sixteen of their sweet sixteen – myself included. My issue has been more of focus – I went for the easiest path upwards where the records were readily available, somewhat easy to read, and the great-grandparents’ names were clear that led me to those records. Others have said that their blanks are caused by naming issues, and some have simply said they don’t know what to do to fill in those blanks. Because of that, this particular edition of Randy’s SNGF was more than just a chance at bragging rights around the genealogists’ round table – it’s a serious opportunity for folks to lay out their research problems and get advice and input from hundreds of other geneabloggers! 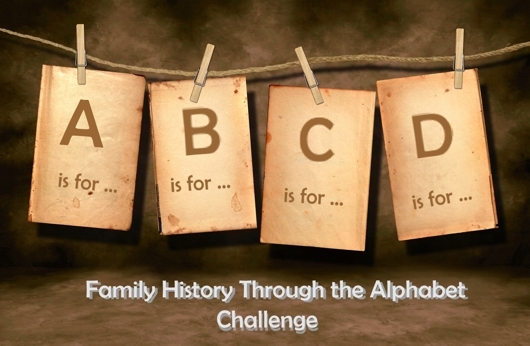 No one ever said genealogy was easy – if someone told you that, they lied. It’s hard work. It’s hard detective work. Like most hard problems, the solution can only be found by taking one step at a time. Back in January, Miriam wrote Who Are Our Brickwall Ancestors, and Why Aren’t We Blogging About Them Regularly? In this post, she challenged us to write more about our brickwall ancestors in hopes of getting help from others – sometimes all it takes is a fresh look to gain a new perspective. Miriam even proposed a suggested format, and many bloggers have followed her advice with great posts. Some have blogged about their brickwalls, and later blogged about breaking them down! I prefer to call my blanks roadblocks, but no matter what you name it, it is still an opportunity for research! My only research plan in response to Miriam’s challenge was Research Plan: Finding Death Dates for Joseph Bergmeister and Ursula Goetz. Joseph Bergmeister and Ursula Dallmeier Bergmeister Goetz happen to be two of my sixteen great-great-grands, and while I know their names, birth dates, locations, and parents’ names, I never completed my research by finding their death dates. By developing the research plan, I have a clear idea of both the known facts and the clues to help me solve the unknown details. Although I have not had time yet to follow through with the plan, it is ready and waiting for me when I have more time. But at least I had their names! Now that some of us have cringed at the “blanks” in our “sweet sixteens”, it’s time to come up with research plans to resolve any blank spots. Like I said in my post Sweet Sixteen: My Great-Great Grandparents, my tree is currently lopsided. Some branches reach high into the air and are filled with green sprouts, while other are these little twig stubs lost in the foliage. The first branch I need to concentrate on is my patrilineal line: the PIONTKOWSKI branch. I have several clues on where to go next. 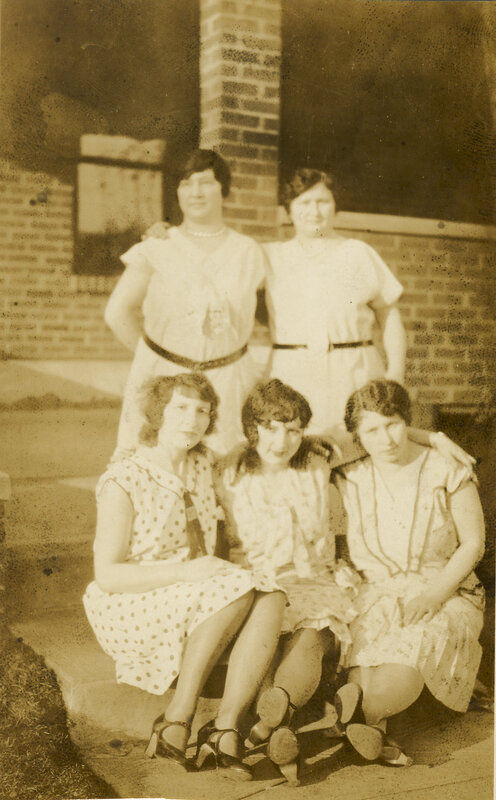 In fact, I could learn the names of three of my missing sixteen by obtaining the marriage record of my great-grandparents, Jan Piontkowski and Rose Kieswetter. Soon I will come up with a research plan and present it here as a “continuation” of Randy’s challenge, and then I will try to develop research plans for the remaining “missing” information. Even if I can’t get to the actual research right away, I will have “directions” on how to get me around this particular roadblock when I have the opportunity. It’s time to stop ignoring those barren branches while climbing higher on the healthy ones! Are you ready to try to fill in those blanks? 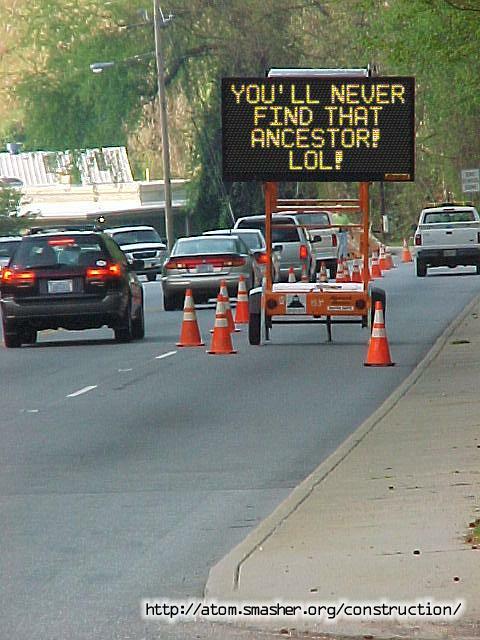 Do all genealogists encounter roadblocks like this? The topic for the 22nd edition of the Carnival of Central and Eastern European Genealogy is roadblocks and breakthroughs. I like the using the term “roadblock” for those genealogy research problems rather than the term “brickwall” because a roadblock seems more like an obstacle I can “get around” or overcome. We can always detour our way around a roadblock; knocking down a brickwall is possible, but it requires some heavy duty equipment. I’m an optimistic genealogist, because I believe you never really encounter a brickwall unless all possible records for an individual or a locality do not exist. Roadblocks, however, crop up all the time – even on what seems like the simplest genealogical task. Just like a real roadblock you might encounter while driving, you usually don’t expect it and may not know the way around it. The most common roadblock in my research has been related to NAMES. That is, you know what name you are looking for, but you can’t seem to FIND it in an index. Causes for these name roadblocks include foreign spelling, foreign accents, bad handwriting, nicknames, and name changes. Many of my ancestors’ Polish and German names have caused delays in my research, but you can often detour around the roadblock if only you know the way. In this post, I’ll offer a few tips that may help you with name roadblocks. Although my own ancestry is Central and Eastern European, the tips to breaking through this particular roadblock are useful no matter where your family’s history began. 1. Use alternate searches – if possible, search for the first name and other identifiers rather than the surname. 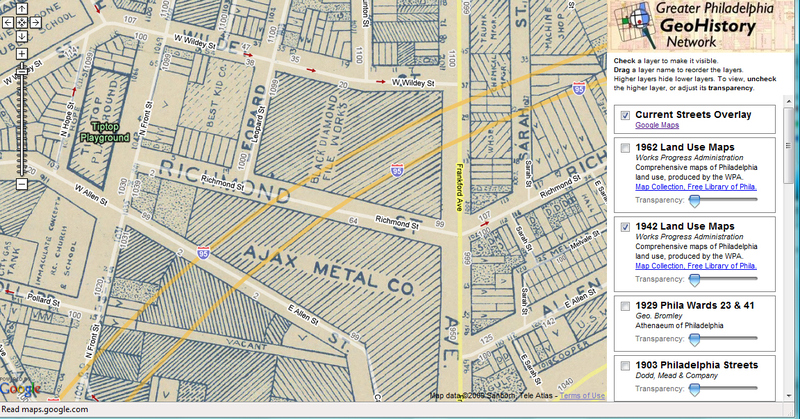 If you can’t find a family on a census record, find the possible address using other sources and then search for the address instead of the name. I was able to find my Zawodny family this way when the census had them listed as Cawodny. 2. Get creative – if the first letter of the last name is incorrectly indexed – whether through bad handwriting or bad indexing, try variations. Try writing out the name in the style of handwriting used at the time the record was compiled. Would a handwritten “P” resemble an “F”? 3. Watch out for nicknames – don’t overlook your ancestor because they are using a nickname, their middle name, or the “foreign” first name from their home country. Ludwig, Louis, Lewis, or Lou could all be the correct first name for an individual. Some researchers get stumped looking for Uncle Bill or Aunt Stella only to discover that they could have found the record looking for Bołesław or Stanisława. 4. Learn all about the surnames from your immigrant’s home country. In Poland, surnames can have masculine or feminine endings – so Piontkowski’s wife or daughter is Piontkowska and Zawodny’s wife or daugher is Zawodna. These practices were still used in the US in the early 20th Century. Russian and some other Slavic languages use similar feminine forms. In German, feminine forms are uncommon today, but in older records you may see the suffixes –in, -yn, -s, -z, or –en added to the male surname for feminine forms of the name. 5. Try phoenetic sound of name for alternate spelling that Soundex might not pick up. Sometimes we forget that our immigrant ancestors had accents. Since the information in some records came from your ancestors speaking directly to someone collecting the information, it is important to remember their native language and its pronunciations. In many cases, the use of Soundex in indexing will cover up for many of these phoenetic mistakes – but not all. Take time to learn the nuances of your family’s native languages. A simple example of a mis-spelled name on a census record that was likely caused by the immigrant’s accent is my great-grandfather’s Polish surname, Pater. It is a relatively simple name as far as Polish names go! Rather than the English pronunciation of the name, PAY-ter, the Polish pronunciation is PAH-ter, much like the Latin word. On the 1910 census, the family is listed as “Potter” – a reasonable assumption based on how it is pronounced. Fortunately, Soundex will catch this error. But what happens when the pronunciation is very different? Polish ą – pronounced “ahn” but it is often transcribed as a simple “a” in English. So the Polish surname Piątkowski may be indexed as Piatkowski. But, if you heard the name pronounced, the English transcription should be Piontkowski. If searching for “Piontkowski” using the Soundex code, an entry under “Piatkowski” would not show up. Polish Ł or ł – pronounced with an English “w” sound, this Polish letter confuses non-Poles. It may be transcribed as a simple English “L”, or the lowercase version may become a “t” since that is what it looks like. Or the record-writer has heard the name pronouced and makes it a “W” so that the surname Łaski is indexed as it sounds to the American ear – Waski. German ü – Americans don’t know what to make of German umlauts. Sometimes the umlaut is simply ignored, so the surname Müller is spelled Muller. Other times it is listed as Mueller, since the “ü” has a “ue” sound. But just as often I have found it as Miller, as if the ü is two letter “i” – and since English doesn’t have words like Miiller, it becomes Miller. I could continue with examples of the different letters found in foreign languages from the French ç to the Hungarian Á to the Croatian Ð. Aside from the unique letters, researching foreign names has to take the language into consideration – a “ch” combination in one language may sound like an “English” “ch” or a “k” instead. In German, the sound of an initial consonant “B” often sounds like a “P”. The point is to be aware of the way the immigrant’s original language sounded, because it may account for some of the incorrect spellings you will encounter. I can’t emphasis enough the importance of learning about the language from which the name is derived. It may give you enough knowledge to break through that roadblock! Polish Surnames: Origins and Meanings, Second Edition by William F. Hoffman (Polish Genealogical Society of America, Chicago, IL, 1997). First Names of the Polish Commonwealth: Origins and Meanings by William F. Hoffman and George W. Helon (Polish Genealogical Society of America, Chicago, IL, 1998). Dictionary of German Names by Hans Bahlow (Max Kade Institute, 2002). Geography Awareness Week (November 16-22, 2008) is drawing to a close. I was delighted to learn about it from Lisa, who had several posts at 100 Years in America related to her ancestors’ countries. Inspired, Jessica also took up the cause and made us all more aware of our own geographical incompetence! Their posts made me realize how much I enjoy geography. As a traveler, I love to pour over maps and figure out where I want to go, or even to figure out where I was (maps were useless in Venice, so I was only able to see where we were in retrospect). Fortunately, I inherited my sense of direction from my father; my mother actually got lost five blocks from our house when I was a child – I thought for sure we’d never make it home. As citizens of this earth, it’s fun to learn about all of the wonders of it. But as genealogists, it’s absolutely vital to develop a sense of historical geographical awareness. By this I mean a knowledge of a place’s name or boundary changes throughout its history. Without this knowledge, we might never actually find our ancestors! This sense of historical geography awareness, which Lisa so eloquently called going back in time, helps us track the genealogy of a place. I’ve noted many times on this blog how important it was to learn about Polish history in order to accurately determine where to obtain vital records for my ancestors, for Poland was ruled by the Russian Empire, Prussia or the German Empire, and Austria for over a century. Parts of the country belonged to other countries as well as Poland expanded, shrunk, or disappeared altogether. Researchers who find evidence that their ancestor was born in Danzig, Prussia, need to know that the town today is Gdańsk, Poland. Most European countries have had similar boundary changes in their histories as well. 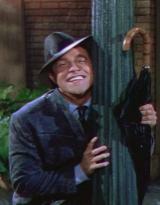 Why, I was delighted when a commenter informed me that the origins of my Bergmeister family may be found in Bozen. Bozen is a town in an area known as Südtirol, once part of the Austro-Hungarian Empire and/or Austria. But I knew the town by its current name, Bolzano, which has been Italian since the end of World War I. I finally found my Italian roots! Who knew? It’s important to remember that not only countries shift borders or change names, but also states and towns. 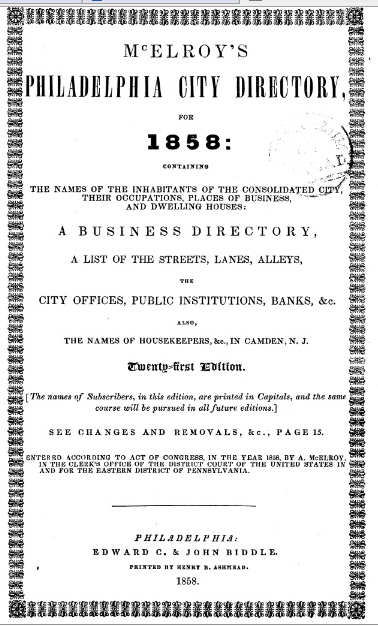 For example, the city of Philadelphia did not have its current borders until 1854; the original city limits were much smaller, and the city expanded over time. Learning these changes throughout the years in which your ancestor lived there is a must, because you won’t know where to look for records. Simply looking at a map is a must – if you can’t find an ancestor in a census but the state line is only five miles from where they lived, perhaps you should try the neighboring state! I gained a greater sense of historical geography awareness in researching my Pater family. When my 2nd great-grandfather Joseph Pater arrived in the U.S. from Poland, he went to Philadelphia. When I found the passenger arrival records for his wife and daughters, I was surprised to see that they listed their destination as joining Joseph in “Eden, PA”. Uh, where? I couldn’t find a town called Eden nearby, and I had never heard of it. I would have discounted the find entirely based on this, but the names and ages were a perfect fit. With a little investigation into the geography of my corner of Pennsylvania, I discovered that the Borough of Eden had existed only for a few years before the name was changed to Penndel, a town I knew. The Pater’s lived there for at least eight years, likely working in the local textile mill, before moving back into the nearby city of Philadelphia. So remember, kids, learn your geography if you want help with your genealogy! I’d like to close with a question to my readers: when recording your ancestral information, whether you use computer programs or just on paper, do you record the town/state or province/country as it exists today, or as it existed at the time of the event? Do I record my great-grandparents’ birth country as Germany, but their ancestors birth country as The Kingdom of Bavaria – even though it’s the same town? Do I record my Polish ancestors’ life events as taking place in the Russian Empire, or in Poland – even if it didn’t officially exist? I’m curious how others deal with changing names or boundaries, so please let me know in the comments!